Probably, the cheapest method to avoid parallax errors is the Philopod. Basically, a piece of string with a weight in the end, tied around your lens body. I've tried this approach, but while it might work just fine for you, I found that while it does decrease parallax errors, they are hard to avoid entirely. Especially, if you shoot using your camera's default lens at ~18 mm, like I do. The more precise solution is to mount a panoramic head on your tripod, and then your camera on the panoramic head. These panoheads can be purchased for a relatively high price. Or, there is the hobbyist way: Build your own! This simple type of panoramic head consists of an L-shaped piece, mounted on the tripod, and of a swinging arm that sits on the L piece. 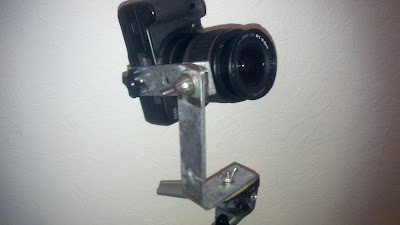 The camera will then be mounted on the swinging arm, allowing for portrait shooting, only. I went to my local builder's merchant to buy these two pieces, which are essentially just two pieces of metal, where one is bent in a 90º angle. Try to get some with as few holes in them as possible, as we want to decide where the holes should be, ourselves. 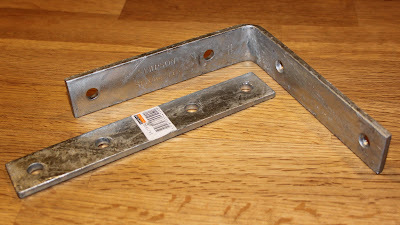 Along with them I bought some nuts and bolts to fit the pieces together (size 'M6x20', i.e. 6 mm diameter, 20 mm long), and some wingnuts so that it would be easy to adjust the panohead 'in the field', without the use of any tools. Oh, and some washers. The large bolt like piece on the left in the image is not one that I bought. It's from my tripod -- I'll get back to that later. 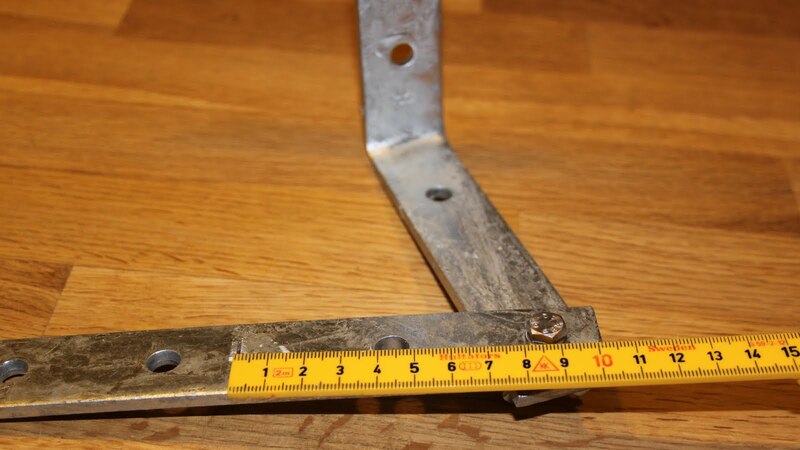 If you don't have it already, you will also need to get some tools to drill a few holes in the metal pieces, and to cut off the excess parts of the metal pieces. My metal pieces came with pre-drilled holes, of which some were placed so that I could use them for assembling the pieces. If yours don't, you'll need to drill a hole in one end of each piece which will allow for the joint of the two pieces. Two distances are essential to a panoramic head like this one: The distance from the swinging arm to the hole where the L piece is mounted onto the tripod, and the distance from the L piece/swinging arm joint to the hole where the camera is mounted on the swinging arm. You can either measure these distances yourself or use the great Entrance Pupil Database. The former distance (sometimes called the 'tripod mount height') needs to correspond to the vertical distance from the camera's mounting point to the centre of the lens. 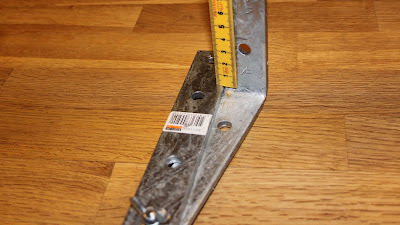 This is easiest to measure by putting the camera on a flat surface, like a table. Or find it in the database mentioned above. You will also need to check that the 'tripod mount off-center' is 0 in the database for your camera, or you will need to take this into account when drilling your hole. As an example, for a Canon 500D, this value is 38.5 mm. On my L piece I ran into a problem, since a pre-drilled hole would interfere with the hole that I was about to drill. 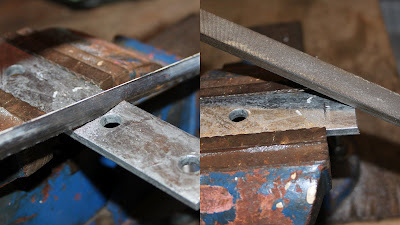 I solved this by putting a spacer made from excess metal that I cut off (see below) between the L piece and the swinging arm. But remember to add the thickness of this spacer to the distance to the hole. The latter distance needs to correspond to the distance from the camera's mounting point to the no-parallax point in the lens body. This is probably the hardest thing to measure, as the no-parallax point is located inside the lens body. Also, it will change when you chance lenses, or if you use the zoom on a zoom lens. The easiest way to find this distance is probably to calculate it from values found at the database mentioned above. Find the 'tripod mount length' for your camera, and the 'entrance pupil length' for your lens at a given focal length, and add these two numbers together. 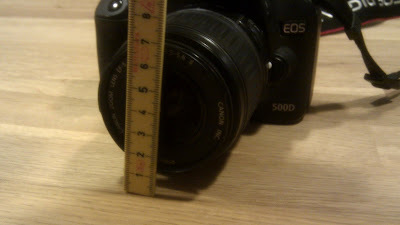 For my standard Canon 18-55 mm lens at 18 mm on a Canon 500D, it would be around 39 mm + 47 mm = 86 mm. 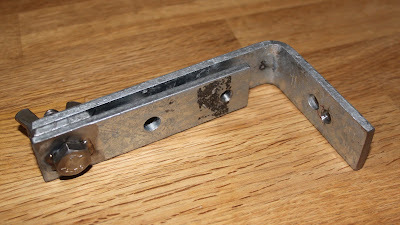 I then assembled the L piece with the swinging arm by putting a bolt through the holes and tightening a wingnut onto it. Remember to also put on a washer, right before the (wing)nut. Once the L piece and the swinging arm are assembled, in my case, both parts have rather long, unnecessary parts sticking out to the side. I cut these off (and used some of the cut-off material for the spacer mentioned above) and filed the ends a bit to avoid sharp edges. I was lucky enough to know someone with a welding machine, which enabled me to have the bolt welded onto the swinging arm. This way, it won't just turn around when I'm trying to tighten the wingnut in the middle of shooting a panorama. Also, I had the spacer welded onto the L piece so that it will just sit there nicely when loosening and tightening the wingnut. I guess the same effect can be achieved with a piece of double-sided tape, since most of the time it's held tightly into place by the metal parts. 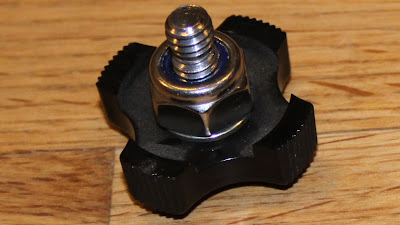 My original idea was that if using the correctly sized nuts and bolts, I would just mount the L piece on the tripod by fitting a (winged) nut on the tripod's screw threaded bolt piece where you'd normally mount the camera. Likewise, I'd planned to mount the camera onto the swinging arm by using a simple bolt. 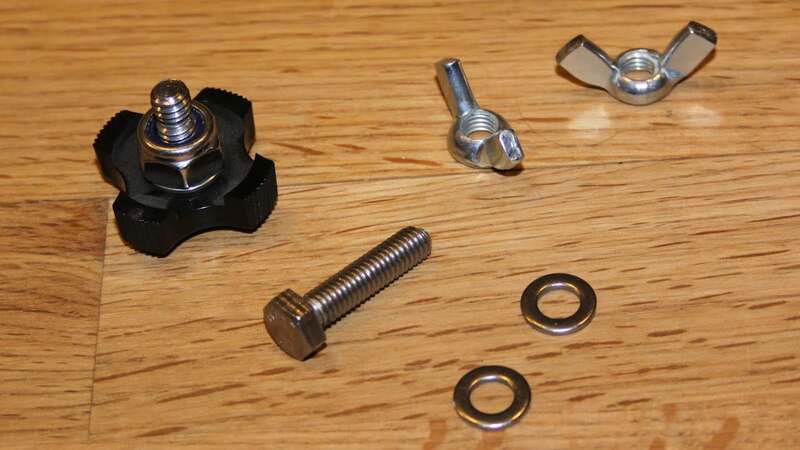 However, I found out that cameras and tripods use screw threads called British Standard Whitworth, while where I am located, you will find only ISO threaded bolts in your average hardware store. So, even if the nuts and bolts appear to have the correct diameters, you can't mount them on your camera and tripod without breaking either. Therefore, I ended up switching to an old tripod that I could take apart. I removed its bolt piece, replacing it with one of my newly-bought bolts. 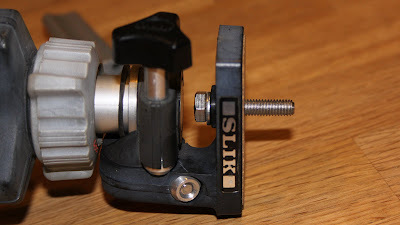 This bolt piece from the tripod was then used to mount the camera onto the swinging arm instead. The nut you see on the image is just for spacing, since the tripod's bolt piece would otherwise (now dismounted from the tripod) be too long to fit into the camera. If you live in America, this probably won't be a problem (either way, it would be nice to hear about your experiences with this). With this home-brew panoramic head, my panoramas are now much less prone to parallax errors. I found that, while before parallax was my main headache in stitching a panorama, I now mostly struggle with moving branches, clouds, and the like -- something a panoramic head will, of course, never solve. I deliberately used mounting holes instead of a slots for the camera. I want to be able to quickly mount and demount without having to worry about putting the camera in the exact right place each time. If, at a later point, I decide to get a wide angle lens, I should be able to drill another hole that fits this camera/lens combination perfectly. Actually, there is one thing that I would like to change before I consider the panohead completely finished. 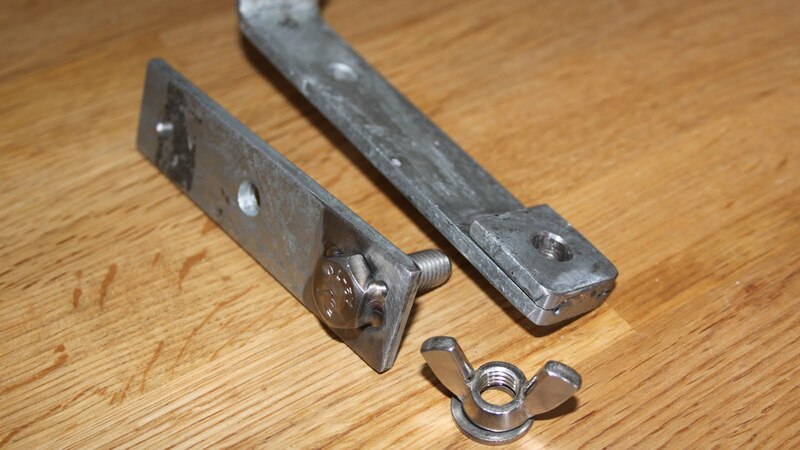 For assembling the L piece with the swinging arm, I used a set of nut and bolt which has a larger diameter than the other nuts and bolts. I did this in order to make use of the pre-drilled holes that were in the metal pieces when I bought them. However, this larger bolt also has a larger "head" than I originally planned on, which means that for my camera lens not to rest against this "bolt head", I had to put a couple of washers between the swinging arm and the camera. This, in turn, places the camera a few millimetres off its ideal placing, and it leaves me with a couple of tiny, loose parts to handle when (re)mounting the camera onto the device. I'm not sure if the slight displacement has any negative effect in practice, though, but the solution should be quite simple: File off some millimetres of the "bolt head". Also, if I were to do the panohead again from scratch, I would have chosen an L piece which was slightly longer. Currently, I'm not able to point the camera straightly upwards, or the camera will hit the bottom part of the device. It would have been nice to be able to shoot zenith(s) without moving the tripod. As a work-around, I shoot both zenith and nadir, only when I'm done shooting everything else, and thus can safely move the setup. Quick panorama shot using my homemade panohead.